Concept: This late successional mixedwood Vegetation Type (VT) has an overstory co-dominated by red spruce and yellow birch, with lesser amounts of mostly shade-tolerant trees. It is similar to MW3 (Hemlock – Yellow birch / Evergreen wood fern), but with greater red spruce prominence. In eastern Nova Scotia, balsam fir can take the place of red spruce in this VT (e.g. St. George's ecodistrict). The longevity and shade tolerance of the dominant overstory tree species aids in the development of old forest characteristics, maintained by gap disturbances. Vegetation: Red spruce and yellow birch are the dominant overstory trees. A suite of other shade-tolerant trees (e.g. sugar maple, hemlock, beech, balsam fir, red maple, white pine and white ash) may also be present to varying degrees. The shrub layer is moderately developed and includes mainly regenerating trees, striped maple and fly-honeysuckle. 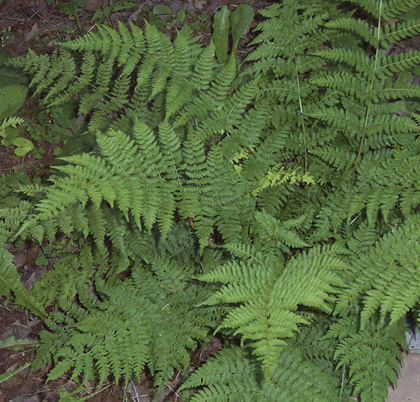 Several fern species are common in the well-developed herb layer including evergreen wood fern, New York fern and hay-scented fern. Wood sorrel, wood aster, rose twisted stalk, Indian cucumber root and some club-mosses are also common. Herb layer species can be used to assess relative site conditions, with hay-scented fern usually found on drier, poorer sites, and Christmas fern, northern beech fern and shining club-moss found on moister, richer sites. Bryophyte development varies, with coverage directly related to relative softwood abundance in the overstory. Schreber's moss and stair-step moss are the main species. Bazzania can also be common where coarse woody debris has accumulated on the forest floor. Environmental Setting: MW1 is mainly associated with fresh to fresh-moist, nutrient medium to rich soils of variable texture. This VT can be found throughout mainland Nova Scotia, but is most common in central and eastern sections of the province and along the Bay of Fundy shore. 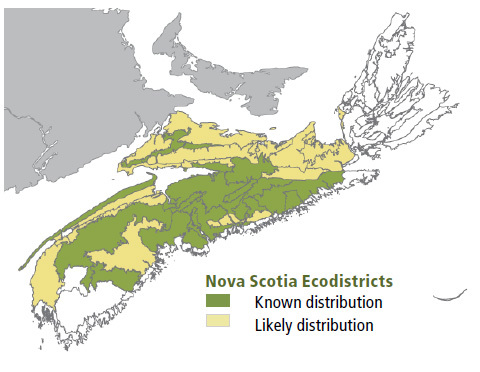 Coarse woody debris coverage can be quite variable on MW1 sites due to the short lifespan of balsam fir which is always a significant component of this VT. Red spruce – Yellow birch / Evergreen wood fern is a climax Acadian mixedwood VT found on zonal sites throughout mainland Nova Scotia. This VT is also found throughout New Brunswick, but is absent from Prince Edward Island. Successional Dynamics: MW1 is a late successional climatic climax VT dominated by red spruce and yellow birch. It can develop from several early and mid-successional VTs including SH5 (Red spruce – Balsam fir / Schreber's moss), SH6 (Red spruce – Balsam fir / Stair-step moss – Sphagnum), SH8 (Balsam fir / Wood fern / Schreber's moss) and MW4 (Balsam fir – Red maple / Wood sorrel – Goldthread). Early successional stages can be by-passed if, at the time of disturbance, advanced red spruce and yellow birch regeneration is present and retained. Depending on disturbance history, this VT can be even-aged, but it will develop an uneven-aged structure as it matures. Between large-scale disturbance events, this VT will maintain itself through gap replacement or possibly transition to MW3 (Hemlock – Yellow birch / Evergreen wood fern). Ecological Features: This closed canopy forest is matrix-forming in central Nova Scotia and a large patch forest elsewhere. The shade tolerance and longevity of red spruce and yellow birch promotes development of uneven-aged canopy structures and old growth. Large trees can provide nest sites for pileated woodpeckers, barred owls, red-tailed hawks and northern goshawks. Downed coarse woody debris may provide cover for red-backed salamanders and small mammals. Mixedwood forests can also provide both shelter and food for overwintering deer. Yellow birch is an abundant source of seed during the winter for many species of birds and small mammals. Birch trees in these forests may be deformed, and eventually killed, by birch cinder conch, a fungal growth occasionally harvested for Chaga tea. 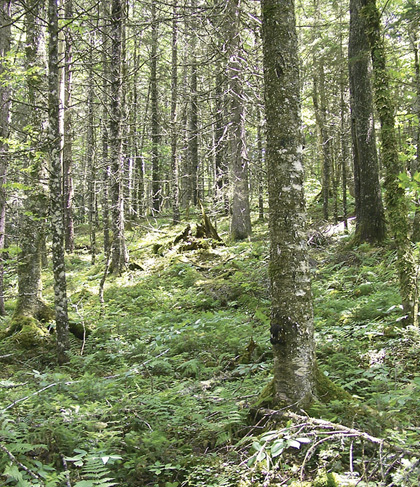 Distinguishing Features: Yellow birch and red spruce dominate these mixedwood forests that occur on well drained soils. In eastern Nova Scotia the red spruce is often replaced by balsam fir. An assortment of ferns, notably evergreen wood fern, New York fern and hay-scented fern dominate the herb layer.